Gonzaga had two chances to tie the game near the end of regulation, but Zach Norvell Jr. and Rui Hachimura were unable to connect as the Volunteers completed the upset. PHOENIX — It was all lining up for the Zags. Brandon Clarke was enjoying a big afternoon in his return to his hometown. Zach Norvell Jr. was doing Norvell things, heating up in the second half as Gonzaga’s lead reached nine. Tennessee’s Grant Williams, the 2018 SEC player of the year, was on the bench after fouling out with 2:30 remaining. But the top-ranked Zags, as they’ve done in several games in recent weeks, couldn’t protect a late lead. Worse, they lost track of Admiral Schofield, who carried Tennessee’s offense throughout the second half on his broad shoulders. Schofield’s banked 3-pointer gave the Volunteers the lead and his pure 3-pointer on a GU defensive mistake with 22 seconds remaining spurred No. 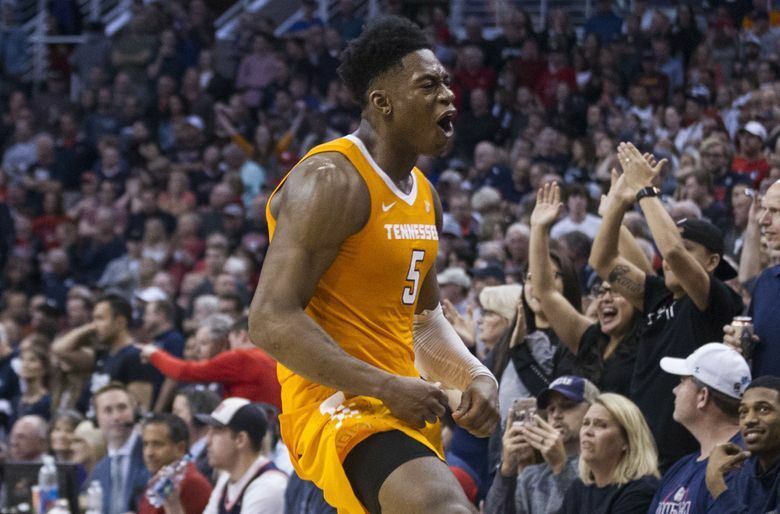 7 Tennessee’s 76-73 upset victory Sunday in the Jerry Colangelo Classic at Talking Stick Resort Arena. There was no mystery where the ball was going on most of the Volunteers’ possessions. Schofield scored his team’s last 11 points and he had a 12-point run earlier in the half that kept Tennessee (7-1) within striking distance. Gonzaga (9-1) couldn’t find anybody to stop Schofield. The Zags tried a zone defense, but had to abandon it when Schofield and the Vols, not known for their 3-point prowess, started connecting from distance. They tried Norvell, Corey Kispert and finally Rui Hachimura. None of it slowed Schofield en route to his career high. Hachimura tied it at 73 with two free throws with 45.8 seconds left. Tennessee called timeout and coach Rick Barnes said the ensuing play came off as scripted. Schofield set a screen near the top of the key for Jordan Bone, who was defended by Josh Perkins. Bone took one dribble to his left, drawing Perkins and Hachimura, who dropped into the key below Perkins. Bone zipped a pass to Schofield who connected on the last of his six 3-pointers from beyond the NBA 3-point line before Hachimura could recover. Norvell and Hachimura each missed long 3-pointers, sandwiched around Kyle Alexander’s missed free throw, that would have tied it. Schofield hit three 3-pointers in the final 3:18. The 6-foot-6, 241-pound senior wing scored 23 of Tennessee’s last 33 points. Neither is Norvell, who rebounded from a scoreless first half with 13 points. Norvell and Schofield seemed like they were playing a game of H-O-R-S-E for a stretch, both hitting shots from all over the court and letting each other know about it. Norvell cooled off late, partly due to the defensive work of Jordan Bowden, and so did the Zags’ offense. Only five Zags scored: Hachimura and Clarke both had 21, Norvell and Kispert each had 13 and Filip Petrusev added Gonzaga’s five bench points. The Zags didn’t have a field goal in the final 4:10 after Kispert’s driving layup gave Gonzaga a 68-63 lead. Tennessee kept finding Schofield, kept capitalizing on Gonzaga’s 11 turnovers (16-3 edge in points after turnovers) and kept working the offensive boards (16, leading to 14 points).